Journals are written in the 1st person past tense simply because diaries contain details of what’s already taken place, and generally people don’t journal in 3rd person or 2nd person, but if you know of someone (or some story) that does, please share! Most Journals deal with heavy issues, like abuse, bullying, poverty, war and addiction. And even the ones that are lighter still deal with life-changing moments that feel super heavy to a teen encountering them, like a best friend moving away (SLOPPY FIRSTS), and puberty (ARE YOU THERE GOD? IT’S ME, MARGARET). Because teenagers express themselves with more than words, these journals may include drawings and notes in the margins, like THE ABSOLUTELY TRUE DIARY OF A PART-TIME INDIAN and GABI, GIRL IN PIECES. Finally, most Journals have a healthy dose of humor with their angst. Because laughing is often our way of accepting harsh truths and dealing with pain. Junior’s self portrait of himself. THE ABSOLUTELY TRUE DIARY OF A PART-TIME INDIAN by Sherman Alexi. · ISSUE: Life between the reservation and the white kid school, which encompasses heavy topics like poverty, abuse, racism, and addiction. 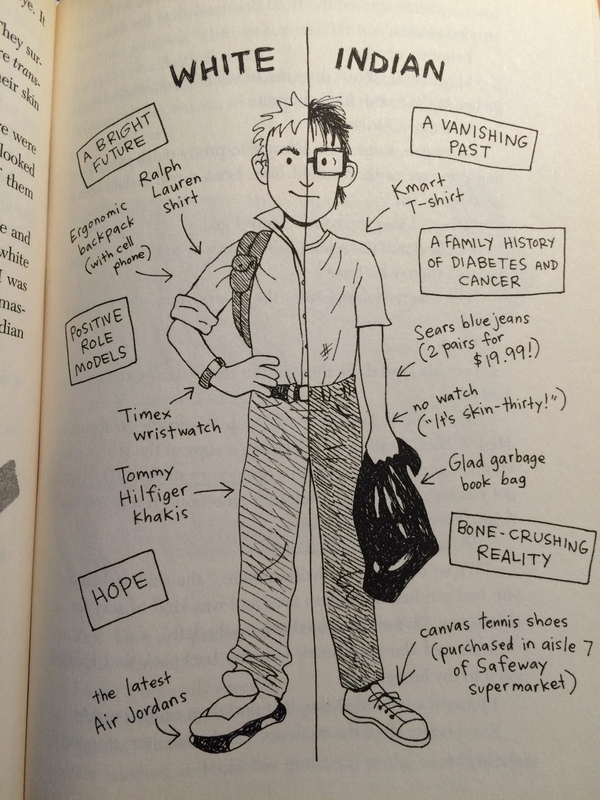 · EXTRAS: The protagonist, Junior, is also a cartoonist, and the book is filled with his sketches. · HUMOR: Despite the many heartaches in this story, the narrator knows how to laugh at himself and describes everything with self-deprecating yet wise wit. UNSLUT: A DIARY AND A MEMOIR by Emily Lindin, THE DIARY OF A GIRL by Anne Frank, ARE YOU THERE GOD? IT’S ME, MARGARET by Judy Blume (though technically not a diary but a one-way conversations with God, I feel this is just a creative way of presenting a diary), SLOPPY FIRSTS by Megan McCafferty, THE PERKS OF BEING A WALLFLOWER by Stephen Chbosky (not admittedly a diary, but the MC writes diary-like letters to an anonymous friend that we never meet, so it feels like a diary and may very well be one if you believe – like I do – that there is no pen pal), and GABI, A GIRL IN PIECES by Isabel Quintero. 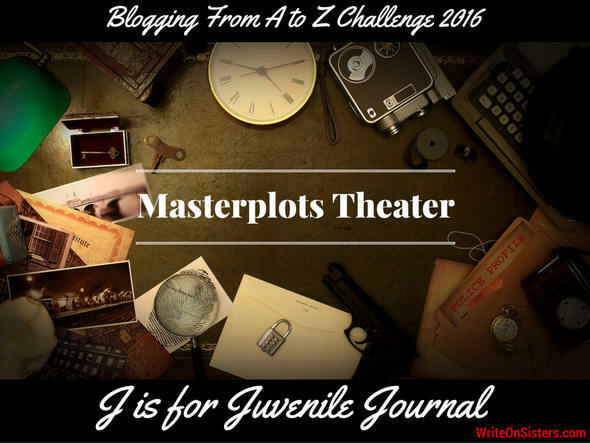 We hope you enjoyed J is for Journal and we invite you back tomorrow for our next installment of Masterplots Theater, K is for Kinsmen. Please share your own favorite journaled stories in the comments below. I can’t stop thinking about this. These are everywhere. There are ones for kids, MG, YA… My brain is buzzing with possibilities. If I write one of these, I’ll blame you. Ha! Happy to inspire you! You’ve inspired! ? Thank you. I’m a bit confused. I don’t understand the difference between a journal/diary and first person. (Only in some novels, obviously.) I peeked at Sloppy Firsts and don’t see how it is considered a diary. There are scenes and descriptions and dialogue between numerous characters. It reads like a first person book unlike some of the others mentioned here. How do you tell the difference (without the publisher listing it as a diary)? Sorry for the confusion! I just went back to look at Sloppy Firsts and realized that no where in the beginning does it explicitly state it is a journal, but because the sections are divided into months and each chapter is a day (i.e. Chapter 1 is January “the second”, Chapter 2 is January “the fifth”), and it’s written in first person past tense (NOT present), and in each chapter the heroine is reflecting on her day, it reads like a diary. Mind you, a very well-written diary with significantly less swearing than the average teen’s reflections, but journal-esque nonetheless. So all I can do is vent here. Who is this for, anyway? Who are you? Who actually found this notebook and cares enough to read it? You must have little to do. No, it was strictly my confusion after reading an excerpt from that book. I’ll have to look more into these. I’ve already started a diary book (it’s pouring out!) but it’s not in past tense so we’ll see how that goes. ? I like journal type stories. They’re intimate and the main character is often so flawed, you wonder who they see when they look in the mirror, making them very interesting as they discover themselves. Very true. The POV in a journal story can be so revealing and enlightening. Thanks for the comment, Sharon! I actually haven’t read those. More books for my To Read pile. Thanks! I wish I had journaled diligently in my youth. One of the journals that I did actually keep for a while was stolen–what a frustrating circumstance that was! I’d love to have that journal back as there was some great information in it and it had been written in great detail. My first journals began when I was a teenager. They were filled with teenage angst. LOL. Thanks for sharing another great post on Master plots. My teenage journals are all angst! At that age, I only wrote when I was unhappy. So in my journals there will be a three month gap of no writing when everything was going great with the latest guy I was dating, and then when we broke up I’d write 80 pages of misery in one weekend. I still have the journals, but they’re embarrassing, so I have a if-anything-happens-to-me-don’t-read-these-please-burn-them message on them all. Eek. I hear you. LOL. But, oh what a treasure they would be for your family. Thanks for sharing it brought a smile to my face. Great choise for the example. Sherman Alexie is my favourite author. The True Diary is waitng for me on my shelf. Enjoy the book! It’s absolutely fantastic. And thanks for the comment!